Last week, on our crazy Tuesday, we had a visitor from our local pediatric dentist's office, Dr. Pyke's Office. We have had them visit us for the last few years and they are just great. A dental hygienist from the office comes with a bag of "goodies." 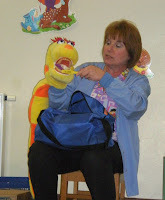 This year we had Ms. Kathy and Ms. Jenn come and teach us some great things about the dentist and caring for our teeth. Then comes out the visitor that is extra special, Sammy the snake with a full mouth of teeth. (I've never seen a snake with a full mouth of teeth either, but he sure is cute.) First the children get to see the different teeth, the gums, and his tongue. Now the hygienist talks about how they should brush their teeth and how often, she brushes Sammy's teeth so they can see. 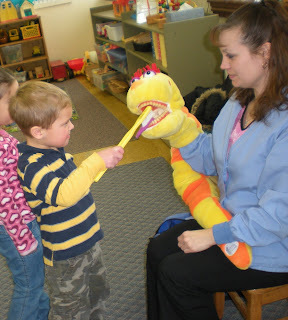 The PM class had extra time so they got to brush Sammy's teeth too. Don't forget to brush your tongue. Lastly comes the flossing and Sammy's teeth are beautiful. Sammy had brought along some goodies too, but not all of them were good for teeth. Sammy brings out the food he brought and the children have to decide if the item would make teeth happy or sad. 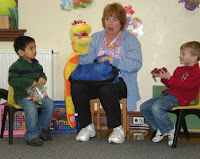 We thank Dr. Pyke's Office, Ms. Kathy, and Ms. Jenn for visiting us and teaching us all about our teeth. I love the puppet! Too cute. Unfortunately, Peanut needs a lot of dental work. She is going to have to be sedated- :(. Not looking forward to it. Hi,I love the puppet,can you tell me where can I buy ? I'm sorry I don't know where you would get the puppet. He actually came with the Ms. Jen from the dentist's office.